A native of Newfoundland, Amanda Gellman is today President of MANAN Strategy Consultants (manan is a Gaelic term for new beginning and opportunities). She is also heavily involved with the Windsor centre for Film, Digital Media & the Creative Arts and The Raindance Centre, and worked with MANAN Strategy and MANAN Media Partners and Collaborators on projects across Canada and globally (see MANAN Team). MANAN is also a partner in The Funding Envelope. Incorporated in November 2008, MANAN’s services include, but are not limited to, strategic planning and visioning, market research, fund development and grant writing, and marketing and branding. Clients and partners have included corporations, not-for-profits, communities and institutions across Canada, the US, Europe and Israel engaged in social outreach, manufacturing, peace efforts, community development, education, poverty relief, health care, green energy, film and agriculture. 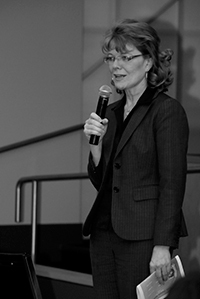 During her career in executive management and professional fundraising, Amanda’s teams of staff and volunteers have raised millions upon millions of dollars ($250M+) in government and private support for worthy endeavours, and continues to combine visioning and resource development under the MANAN umbrella since 2009 ($30+M). She is well versed in all facets of private sector and government cultivation and solicitation. For her past work on behalf of diverse causes, Amanda has received the 40 under 40 in St. Louis Recognition, the McDonnell Douglas Feed America Award, the University of Windsor’s Charles Clark Award, the Queen’s Golden Jubilee Medal, Windsor’s Women of the Year 2002 recognition, the Windsor University Friend of Retirees’ Award, Honorary Membership in the International Golden Key Honour Society (nominated by UWindsor students), the Queen’s Diamond Jubilee Medal and the Canada South Chapter of the Association of Fundraising Professional’s Crystal Lifetime Award. Amanda joined the University of Windsor in October 2001. First appointed Executive Assistant to the President / Liaison to External Affairs, she was hired primarily to oversee their SuperBuild Campaign and serve as the President’s liaison to SWOMEN (Southwestern Ontario Medical Education Network); she was appointed Special Assistant to the President / Associate Vice President Advancement in April 2003, overseeing alumni affairs and fund development. She began her five-year contract as Vice-President of Advancement in January 2004 (until December 2008), which included the offices of special events, communications and public relations, advancement services, fundraising/development and alumni affairs. With great regret, but also excitement to launch her own company, she resigned in July 2008 (staying in her position until Dec 2008 to complete her contract) to launch MANAN Strategy. Amanda has served on close to 40 boards and event committees, and has been the Founding Chair of three non-profits. Amanda served on the Boards of the Great Lakes Manufacturing Council (Treasurer), the Downtown Windsor Business Accelerator (Chair), the Essex Region Conservation Foundation (Making Committee), the Windsor Centre for Film, Digital Media and the Creative Arts (Current President and Founder of the Film Camp for Kids & Youth). She served as four years as the President of the Windsor Regional Hospital Foundation during her 13 years on the Board. Previous Board involvement (in brief) also includes six years with the Windsor Family Credit Union and eight years with Leadership Windsor Essex; other examples are the University of Windsor, the Multicultural Council of Windsor Essex, the St. Louis Hunger Coalition, the TLC Foundation, AIDS Walk Canada, the St. Louis Southside Employment Coalition, the Rural Urban Linkage Project (linking urban farming to urban poverty), and many more. Past Advisor to the Renew Initiative for the Diocese of Huron, she is also Past Chair the Financial Development Committee and past member of the Strategic Planning Task Force for the Anglican Diocese of Huron. Amanda’s various roles with the Association of Fundraising Professionals – AFP have included being a member of the Canadian Council, serving as Past Canadian Government Relations Chair to the International External Relations Committee of AFP International, presenting to the House of Commons Standing Finance Committee, and serving as the Founding Chair of AFP’s Canada South Chapter. Amanda is an active member of the Association of Fundraising Professionals (AFP – Canada and US Chapters) and a past member of the Canadian Association of Gift Planners (CAGP), and follows the code of ethics set forth by those organizations. Amanda has coordinated a South Africa Project through her Anglican parish since 1997 and raised funds to take eight university and college students on a mission to South Africa in May 2013. She was one of two women appointed from 2008-2012 as a representative to the annual NGO parallel sessions at the United Nations Status of Women Conferences in New York where human rights issues are a major focus.